Abobo's Big Adventure - Abobo SMASH! 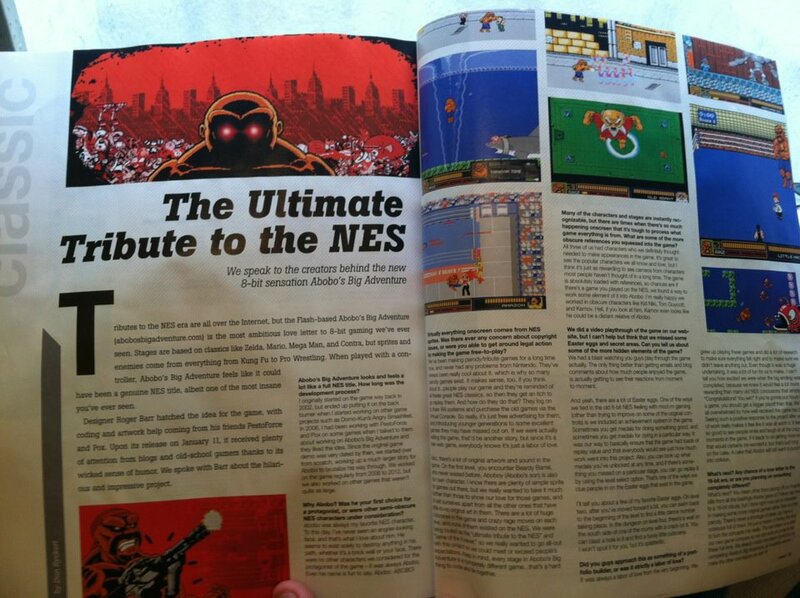 Here's a quick announcement to let you know that Abobo's Big Adventure was featured in a recently printed edition of Game Informer Magazine! The issue # is 228 and it features Assassin's Creed III on the cover. Head to your local GameStop or other gamer-oriented store and pick up a copy for HISTORICAL PURPOSES! It's a bit surreal to see this Flash game we made as a pure tribute to our love of the NES featured in a real big-deal gaming magazine. It brings a tear to our collective eye to know the game has touched a cord in so many people. That is, we WOULD have cried if we hadn't wasted all our tears on the many beatings Abobo has given us through the years. Also, as of this post, Abobo's Big Adventure has been played 3.25 million times since its release about 2 months ago. A huge thanks goes out to all Abobo fans and to all the people who have supported us by writing articles, passing links to friends, and joining our FB page. Extra huge special mega dino thanks go to anyone who has reached into their pocket to donate to our cause, we sure appreciate the support! You guys rock! Abobo's Big Adventure Updated To Version 1.4! The Abobo train to an 8-bit wonderland of powerful punches continues to streamroll its way across the Internet and we couldn't be happier about the reception! Since so many people have been playing the game, we've added it to another site. Abobo's Big Adventure is now available for play on ArmorGames, so be sure to check it out on there and give it some votes to help show your support! That said, there have been some requests for features in Abobo's Big Adventure, so we've updated the game with a few things we thought were worth adding in. -You can press "M" from anywhere in the game to return to the main menu - including during cutscenes! This should come in particularly handy for all you achievement medal hunters so you don't have to refresh your browser. -There is a pause on the intro to the Pro Wrabobo and Punch Abobo areas so you can learn more about the moves you can perform in each of these big battles. -On the intro to the Pro Wrabobo area, we've added in a secret tip for those of you who struggled to complete the tricky Balloon Fight level. -Fixed bug during Punch Abobo fight where it locked up if you got up at the end of the 10 count. -Fixed a bug in Prow Wrabobo where he suddenly vanished (well, we think we fixed it). As always, please let us know if you encounter any new (or old) glitches when playing v.1.4 of Abobo's Big Adventure! Lastly, for all of you who've been asking for a downloadable standalone, browser-free version of the game, it's coming very soon! In addition to that, the game will have a fullscreen mode feature so you can play it much larger! And yes, the game will still be 100% free and you can still use a gamepad to play it as always. Don't forget to vote 5 for us on Newgrounds please! -problems with rage during old man fight? -Running on upper left of pro-wrestling causes freeze? -Sticky keys in some browsers (continues in one direction without any input): Possible Fix here. The response to the game has been wonderful! We're so amazed at all the fan support. You guys rock! Your next task is to keep testing the game and reporting new bugs. You've done great so far! Abobo's Big Adventure is now LIVE! It's finally here! The wait is over and you can finally dive into the world of Abobo, fists first! Please Vote for our game on Newgrounds! A lot of love went into Abobo's Big Adventure. We had no bosses to report to, no budgets to meet, no rules about what we couldn't do... we simply took the time to make the kind of game that we had dreamed about when we were kids. I have to thank Nick and Pox for seeing this immense project through to the very end with me. They put a ton of work into this and the game simply couldn't have turned out this incredibly well without their efforts. I'm incredibly lucky to have good friends like them who share my sense of humor to work on games with. I also have to thank our friends and families for putting up with all the long nights we spent working on the game when we could've been hanging out with them. Thanks to Tom Fulp and the Newgrounds community for showing so much support for our game projects over the years. And lastly, I want to thank you guys for being so patient with us as we kept promising this game year after year. Your undying support really kept us going and we really appreciate so many of you spreading the word about it online. I know it took us forever to complete, but once you've played through the entire thing, you'll see that it was worth the wait. We've added in a ton of custom artwork, cutscenes, unique rage moves on each level, huge boss battles, secrets, unlockables, jokes, and a whopping 100 achievement medals! We even wrote a tutorial so you can learn how to play the game with a genuine NES controller on your computer. You'll also be happy to learn that we've created a convenient Level Select screen which automatically unlocks levels as you beat them. You don't have to beat the game in one sitting... you can always come back and use the Level Select to pick up right where you left off. You can also use it to replay any level if you need to try to unlock additional medals that you missed out on during your first play-through. So here we are. January 11th, 2012. Abobo's Big Adventure, the ultimate tribute to the NES and our masterpiece of 8-bit parodies is finally here. All I want to do now is sit back and enjoy seeing all of you laugh and smile as all of your memories from the golden age of gaming come flooding back in an instant. And don't worry, even if you didn't grow up on these games, you're still going to have a blast playing it as the humor is universal. Do yourself a favor and play through the entire game, because I promise that the ending we've worked up for you will be something you'll remember for the rest of your life. Seeing Abobo's Big Adventure released is a real dream come true. On behalf of Team Bobo, thanks so much for being a part of it. Please drop a comment and let us know what you think of the game! Please Vote for our game on Newgrounds! There seems to be a little confusion about the release of Abobo's Big Adventure, especially for those of you in other countries where it's already Wednesday the 11th, so I thought I would chime in real quickly to clear things up. Abobo's Big Adventure will be released on Wednesday, January 11th, but we never said the exact time, so we're sorry if that caused a little confusion. The countdown clock was to countdown to the day that the game would be coming out, not the exact second. We're in the Pacific time Zone and plan on getting up really early in the morning to put Abobo up live. We would release it at midnight, but then we'd need to stay up 'til 6am monitoring the game to make sure there aren't any catastrophic glitches. And frankly, we've pulled enough all nighters lately, so we'd like to get a decent night of rest before we unleash Abobo upon the world. You guys have waited YEARS for this (as have we), just hold on a little longer and it'll all be worth the wait! :) We're still making some final adjustments to the game and preparing to load it up here on the official site, on Newgrounds.com and on I-Mockery.com, so there's a lot to be done. Plus, those who made donations already received a special, 100% original, bonus mini-game called "Aboboy's Small Adventure" that we sent them via email to help pass the time as a token of our appreciation! So just hold on a little longer... for Abobo is preparing his fists for a whole lot o' punching! "This game gave me a severe case of Nintendo thumb!" "I played this game with my Power Glove on. It feels so... BAD."